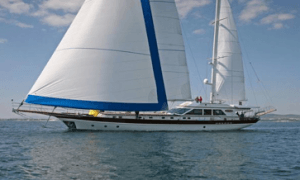 Gulets and Motor Sailers make excellent charter vessels. Spacious and comfortable, they provide enormous deck areas for sunbathing and chilling out under the awnings and superb accommodation in rich, wood panelled cabins with ensuite bathrooms. They have large padded cushions on the aft decks protected by the sun awnings, deck house like a great day bed and forward decks with a smaller table and seats for evening cocktails and feeling the freedom of the beautiful ocean sliding underneath you. Heavily built gulets and motor sailers are very stable both underway and at anchor and with their big engines are great for travelling even when the wind is too light to sail. Perfect charter yachts for families and large groups as many offer accommodation for between 12 and 22 guests and some even more than that. Gulets usually have a huge dining table on the aft deck for dining al fresco, a wonderful saloon area with large windows all around letting in lots of light, further dining area and seating for watching videos of your cruise or catching up on the internet. A superb selection of water sports toys such as wake boarding, jet skiis, paddle boarding, waterskiis, tubes and kayaks is available for guests entertainment and many of them have an on deck jacuzzi. The latest gulets are very stylish and many, such as S/Y DAIMA, S/Y REGINA, S/Y BLUE EYES and S/Y CARPE DIEM are excellent sailing vessels too. 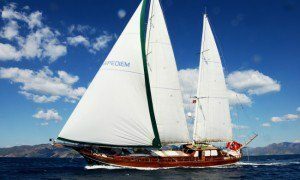 The Bodrum Cup in Turkey is one yacht regatta which gives the opportunity for these to show off their prowess under sail and their owners and charter guests a chance to win the prized trophy. At Indigo Bay Yacht Charters we offer our favourite selection of gulets for charter in Turkey, Greece, Croatia, the Seychelles and Thailand. 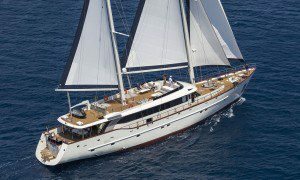 34m Gulet (Motorsailer) 10 guests. 8 Crew. Turkey. From 38,000 Euros pw. Gulet terms. 141' (43m) Gulet Motorsailer. 10 guests. 8 crew. Turkey. 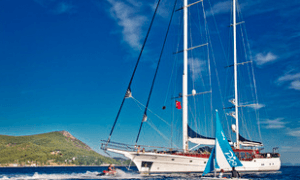 From 65,000 Euros p.w Gulet terms. 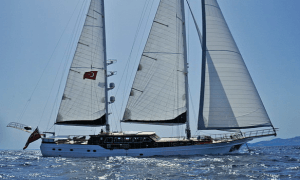 103' (31.5m) Turkish Gulet built by Mural yachts. 8 guests. 3 crew. Turkey & East Med. From $28,801 pw. Gulet terms. 105ft sailing gulet. 8 guests. 4 crew. Turkey. From 9,000 Euros pw. 37.3m Motor Sailer built in 2011. 12 guests. 7 crew. Croatia. From 42,000 Euros per week. 105ft sailing gulet. 12 guests. 5 crew. Turkey. From 23,100 Euros pw. If you may interested in finding out more about charter on one of these incredible yachts, please contact us directly so that we can send you further information, brochures, videos and other media that may not always be available publicly. These yachts are for the lucky few.